Summer is just around the corner which means its time for fresh salads like this strawberry basil burrata salad. Naturally gluten-free, it’s perfect for summer al fresco dining, spring brunch, or just a quick and easy lunch. With fresh strawberries, a homemade strawberry basil dressing, and fresh burrata cheese, this salad screams springtime! I don’t know about you, but I’m ready to ditch the heavy comfort foods of winter and welcome in fresh meal options, like this strawberry basil burrata salad. As the temperatures warm up, and everything outside starts to become green and alive, my body craves fresh ingredients. Am I the only one who goes through this transformation with the seasons? 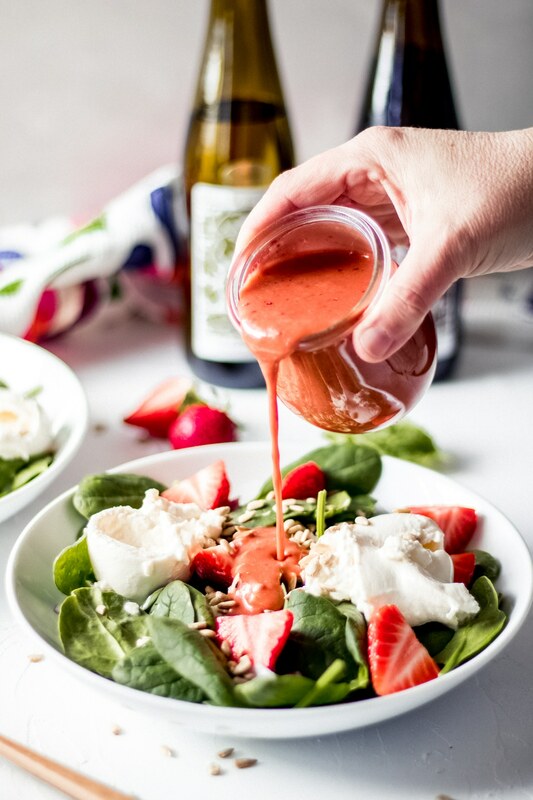 Not only does this salad feature fresh strawberries and burrata cheese, but it also features a homemade strawberry basil salad dressing featuring Olive Tree’s basil olive oil and strawberry balsamic vinegar. Nothing beats a homemade salad dressing where you know exactly what ingredients are included. 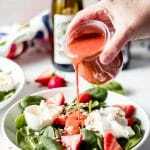 This homemade strawberry basil salad dressing is super simple to make! 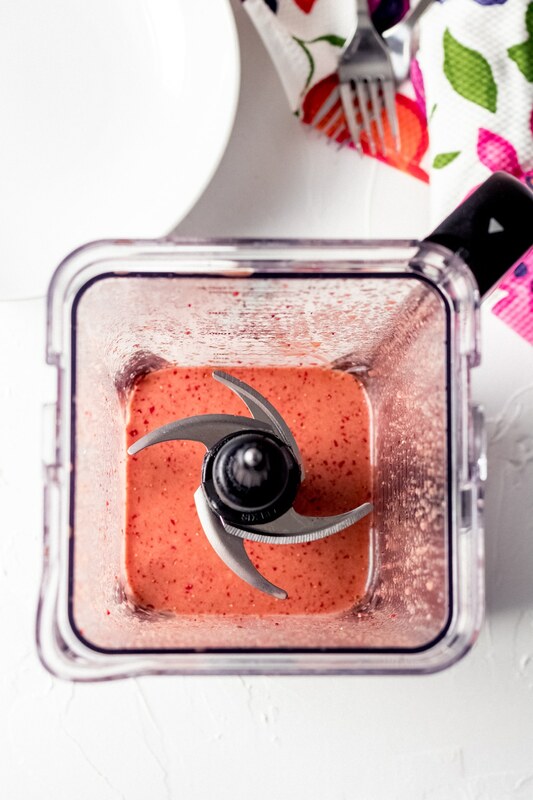 Add the strawberry basil salad dressing ingredients into a blender and blend to combine. Store the homemade salad dressing in an air-tight container such as a mason or jelly jar and refrigerate for up to two weeks. When you’re ready to use, just grab from the refrigerator and pour over your salad! How long does the homemade salad dressing last? If stored in an air-tight container and refrigerated, the dressing should last for up to two weeks. Can I use regular olive oil? Not with this recipe. 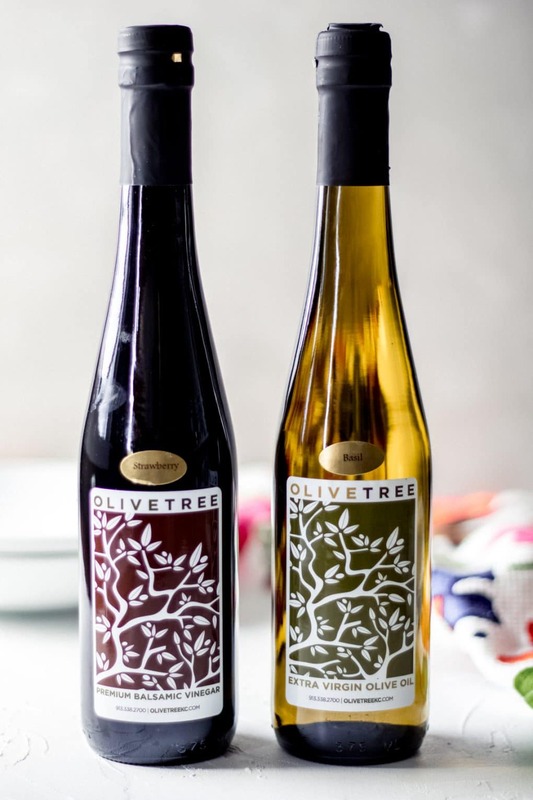 To capture the fresh basil and strawberry flavors in the homemade dressing, you’ll want to use a high-quality basil infused olive oil and strawberry balsamic vinegar, like what our partners at Olive Tree produce. Is this salad gluten free? Yes, all ingredients included in this salad are gluten free. What if I can’t find fresh burrata cheese? Most bigger chain grocery stores will carry fresh burrata cheese in their artisanal cheese section; usually with the fresh mozzarella cheese. If you’re unable to find fresh burrata cheese, you could use fresh mozzarella or if you want a stronger cheese feta cheese would work well with the flavors in this salad, too. Grab these other fresh salad options! 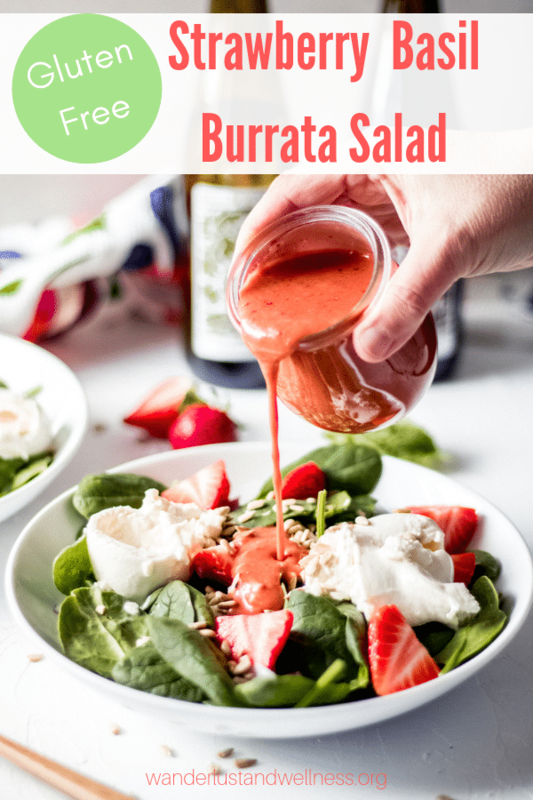 This strawberry basil burrata salad is a fresh springtime salad, featuring a homemade strawberry basil dressing. Add the strawberry basil salad dressing ingredients to a blender and blend until fully combined. Pour from the blender into an air-tight glass jar. To assemble the strawberry basil burrata salads, divide the ingredients into two bowls. 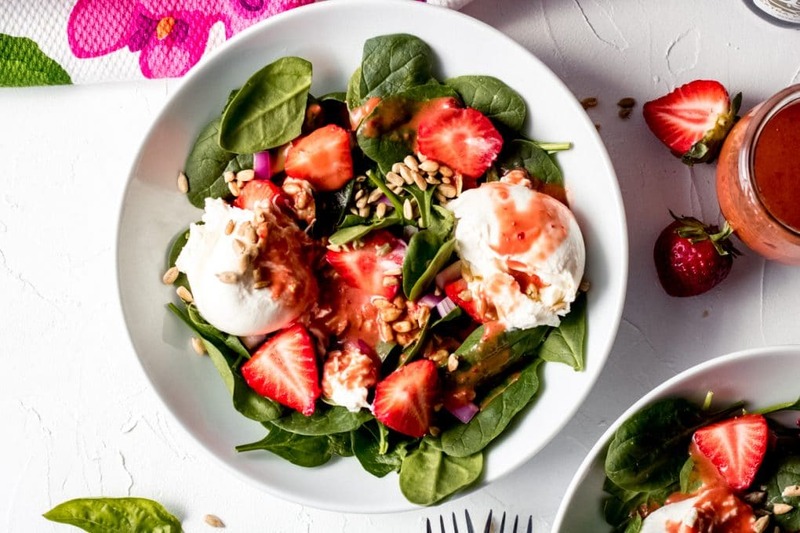 Start with a base of fresh spinach, then add chunks of fresh burrata cheese, sliced strawberries, sunflower seed kernels, chopped red onion, and then top with the homemade strawberry basil salad dressing.